1. chemistry a series of atoms held together by one or more covalent bonds. 2. bacteriology a linear arrangement of living cells that have divided in one plane and remain attached to each other. 3. A series of reactions. 4. In anatomy, a linked series of structures, for example, ossicular chain, chain ganglia , under ganglion. (chān) a collection of objects linked end to end. 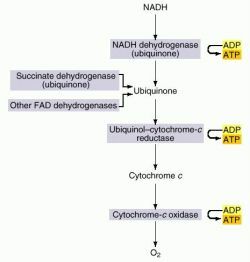 electron transport chain the final common pathway of biological oxidation, the series of electron carriers in the inner mitochondrial membrane that pass electrons from reduced coenzymes to molecular oxygen via sequential redox reactions coupled to proton transport, generating energy for biological processes. Electron transport chain showing the three sites of coupling with oxidative phosphorylation, generating adenosine triphosphate. H chain , heavy chain any of the large polypeptide chains of five classes that, paired with the light chains, make up the antibody molecule. Heavy chains bear the antigenic determinants that differentiate the immunoglobulin classes. L chain , light chain either of the two small polypeptide chains (molecular weight 22,000) that, when linked to heavy chains by disulfide bonds, make up the antibody molecule; they are of two types, kappa and lambda, which are unrelated to immunoglobulin class differences. 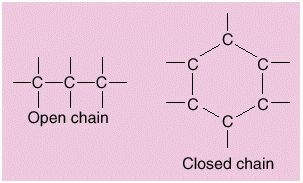 open chain a series of atoms united in a straight line; compounds of this series are related to methane. polypeptide chain the structural element of protein, consisting of a series of amino acid residues (peptides) joined together by peptide bonds. respiratory chain electron transport c.
1 a length of several units linked together in a linear pattern, such as a polypeptide chain of amino acids or a chain of atoms forming a chemical molecule. 2 a group of individual bacteria linked together, such as streptococci formed by a chain of cocci. 3 the serial relationship of certain structures essential to function, such as the chain of ossicles in the middle ear. Each of the small bones moves successively in response to vibration of the tympanic membrane, thus transmitting the auditory stimulus to the oval window. See also chain ligature. 4 a connected series, such as a chain of events. 4. anatomy A linked series of structures, e.g., ossicular chain, chain ganglia. bacteriology a linear arrangement of living cells that have divided in one plane and remain attached to each other.